The closing date for individual entry is 12 Noon - Friday 4th May. The closing date for relays is 12 Noon - Friday 4th May. Individual Events. 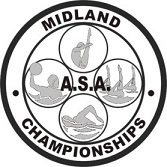 You may enter more than one swimmer using this form and make one payment. Enter the swimmer's registration number or family name to start a search. Please choose the events required. If you do not have a time for an event you may add one. Relay Events The names of all team members must be added using the individual entry form even if they are swimming relays only. The relay entry form is here. You must enter and pay for the relay teams seperately. Postal confirmations will not be sent out concerning your entry. A list of entries can be viewed here.